Control Room, can also comfortably accommodate several players going direct. 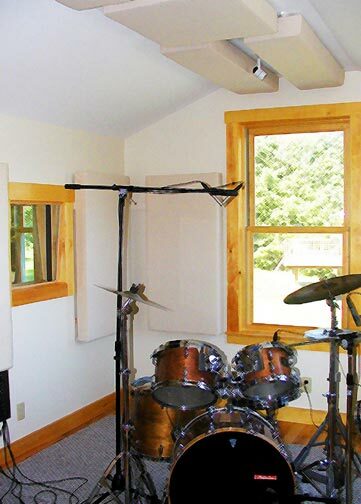 The studio consists of a spacious control room and two acoustically isolated recording rooms. There are windows allowing for sight lines through all rooms. 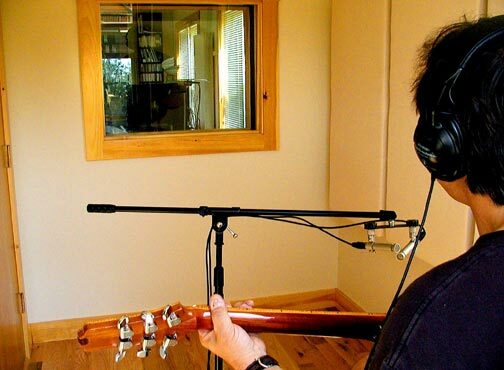 The recording rooms were tuned under the direction of studio designer Steve Blake and sound absolutely great. Our acoustic treatments can be easily adjusted, so we can make the rooms as �live� or �tight� as the music demands. Room A, for drums ensembles, etc. We generally use Logic Pro as our recording environment, and we�re easily compatible with other formats. We have hardware by Pendulum Audio, Great River, Apogee, Joe Meek (Fletcher), Lexicon, Neumann, Royer, AKG, Rode, Kel Audio, Shure, Tannoy, Yamaha, Mackie, and a host of others. Our collection of hardware synths is extensive, and we have some nice vintage guitar amps. We also have a huge complement of software plug-ins including the Universal Audio UAD-1 system. The house drum kit is a vintage Gretsch set with 22� and 18� bass drums. 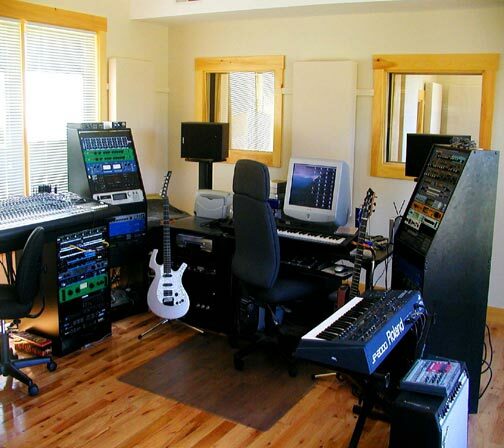 Room �B�, for isolating vocals, acoustic instruments, amps, etc. We�re set up for full ensemble sessions but are adept at interfacing with work in-progress. We can add elements to existing tracks that you may not be equipped to record yourself and are compatible with just about any format.